Jungle Red Writers: CHRISTMAS MUSIC--GRINCH OR ELF? DEBORAH CROMBIE: 'Tis that time of year once more, where the sound of canned carols rings from every shop and and public space! Grinchy gripes have been popping up on the social ether for the last few weeks-- "Oh, no, not blankity-blank Christmas music again!" I have to admit some of the canned stuff is pretty awful, and if I worked retail I'd probably be pulling my hair out the next time I heard a synth version of "Santa Claus is Coming to Town." But I have yet to go in a mall this year, and even on my one foray into Target it was quiet as Christmas midnight. So I've only listened at home, and the truth of it is that I LOVE Christmas music. The CDs and the playlists start right after Thanksgiving and linger into the new year. It's a carryover from childhood for me, I think. My dad loved Christmas music, and loved to sing carols. He wasn't a religious man, so his favorites were the secular songs; White Christmas, Winter Wonderland, and especially Silver Bells. But he could do a mean Silent Night. Tops on my listening list? Jewel's "Joy: A Holiday Collection." Gorgeous. YoYo Ma's "Songs of Joy and Peace," ditto. A collection called "Stockings by the Fire," and always, always, the soundtrack to "Love Actually." Oh, and this year's addition? 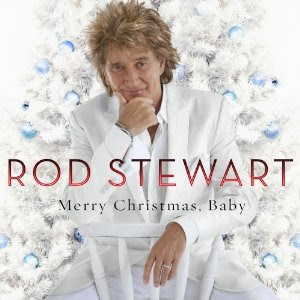 Rod Stewart's "Merry Christmas, Baby." Old gravel voice has mellowed quite nicely, and makes you want to get out that cozy throw and curl up with your hot chocolate. So where do you fall, REDS? Grinch, or singing elf? Here's my little Christmas treat to you all.! Who could resist Ertha Kitt singing "Santa Baby?" JAN BROGAN: I have a folder of holiday music, and the other night I brought out my guitar to refresh my memory. Since we only play these songs for about a month out of the year, it always takes some refreshing. My favorite is Nat King Cole's "Chestnuts Roasting on an Open FIre," although that's not it's title (which no one ever realizes is the actual song). If I start early enough, I can pull it off, but the arrangement is really complicated jazz chords, so it takes me until Christmas is actually over to play it right. Last year, I learned finger pick versions of Silent Night and Auld Lang Syne, which I kept practicing until March in the hopes it would come back quicker when the season rolled around this year- so we shall see.. I do have a version of Santa Baby somewhere, Debs and you are inspiring me to work on it this year. The only one I don't like is this totally morbid song called Christmas Shoes. What a downer. Apparently it was an enormous hit but can't figure out why anyone would want to hear it, particularly at Christmas. Other than that one - bring 'em on! HALLIE EPHRON: Bar-rup bup bup bum... has always sounded like a rude noise to me. So no, I'm not a huge fan of holiday music. Weirdly I like to sing it but I'm not much on listening to it. I love singing the hymns during Advent but not hearing repetitive songs in stores. But my favorite of all is listening to the Messiah. We heard a version of it done by the New Haven Symphony orchestra and a New Haven church choir. We were in the third row and it was magical! HANK PHILLIPPPI RYAN: Can we have the monks withe the placards singing The Hallelujah Chorus It's SO funny! (But okay, I love hearing it even without hte placards.) You're right, Lucy. Magical..and it's impossible not to sing along. I think Hallie has hit on something--I like singing Christmas music more than I like hearing it...But I love I'll Be Home for Christmas, such a dear song. And Have Yourself a Merry Little Christmas . I also love Joni Mitchell's River, which really is a Christmas song... and All I Want for Christmas is You, the song in Love Actually. ANd Santa Baby, Definitely. Yup, Feliz Navidad. We spent lots of family Christmases in Mexico, so you can imaagine, that's almost traditional for us! Of truly traditional? O Come Come Emmanuel. And O Come All Ye Faithful. DEBS: Jan, promise you'll record Santa Baby for us! Ro, I want to hear Chrissie Hynde singing Have Yourself a Merry Little Christmas. Hank and Rhys, I spent quite a few Christmases in Mexico, too, so have a special fondness for Feliz Navidad. And The River is one of our faves, too. And after all this, I have "You better watch out, you better not cry," stuck on repeat in my head, so I'm going to give us one more to get a little Christmas spirit going, All I Want for Christmas, from Love Actually. So what about you, readers? Are you singing along? Love, love, love Christmas music . . . Christmas carols . . . Handel’s “Messiah” . . . “O Holy Night” --- all right at the top of the list. Jackie Evancho’s “O Holy Night” and “Heavenly Christmas” CDs play regularly around here as does my favorite secular piece, Julie London singing “I’d Like You For Christmas.” I never get tired of Christmas music and I can happily listen to those Christmas songs any time of the year . . . . I do like the old traditional carols, but I'm not big on the stuff that's piped over sound systems in the stores. And Christmas Shoes? NO! My favorite is an album I have called a Highland Scots Christmas. Carols on bagpipes. Sounds awful, I know, but it's really wonderful. And Ben loves his albums of Swedish Christmas carols--which are the most peppy, upbeat carols I've ever heard. I really, really love Christmas and I really, really love music especially jingle bell in Christmas season early in the morning.great feel. One of my favorites is a Pete Seeger Christmas album. Just his voice and his banjo singing some of the standards and some unusual ones like "Lo, How a Rose Ere Blooming." I love singing carols. We have a yearly Quaker ceremony of Lessons and Carols where we actually talk and sing (lol-ing at myself here), plus silence, of course. I had the good fortune to sit next to David, a tall hearty man with a wonderful deep voice. The heart was full. I too, LOVE Christmas music. I start listening right after Thanksgiving right on through to Christmas Day. Every year, it is a tradition to add one new CD to the Christmas music collection. My favorite Christmas album of all time if Kathy Mattea's Good News. It is the first appearance of "Mary, Did You Know?" which has quickly become my favorite modern Christmas song. (It's always a close run-off between that and Amy Grant's Breath of Heaven). Interesting to me that both of these songs focus on Mary. Happy Holidays all. I'm off to sing some carols in my cubicle. LOVE Christmas carols/hymns, singing and listening. HATE the radio station that starts playing them right after Halloween! New Christmas album this year: Celtic Woman: A CHristmas Celebration. Magical. Best Christmas album of all time: Christmas with the Rat Pack. I swear you can hear the ice cubes clinking in their drinks as they sing. I make my husband listen to it over and over, and I definitely sing along. Another good one is Christmas Swing, with the classic "What Would Santa Claus Say (when he finds everybody swinging" ... great stuff! Tammy, Christmas with the Rat Pack is going on my wish list. Singing along? You bet. I love love love every year participating in the Sing-Along Messiah, with Tafelmusik, at Massey Hall in Toronto. Conducted by Herr Handel himself. I'm not a big Feliz Navidad fan, though this year my niece and her family sent out an animated JibJab card in which they were dancing around performing it. Hilarious. During the past weekend's baking extravaganza we listened to a reissue of the Staples Singers Christmas album (favorite cut, Go Tell it On the Mountain) and a Jane Monheit CD that has some jazzy arrangements of old standards. For commercial stuff, I like Rockin' Around the Christmas Tree by the incomparable Brenda Lee, perhaps because I have an odd ability to sing it exactly as she does, with the same little squeals and flourishes. She recorded that tune when I was just a year old so I suspect I learned it in the cradle. ...And playing my old records. And, like Edith, I love Lo How a Rose, and like Hank I love River. Laura, I think I heard some of that on PBS Sunday night, it was awesome. Debs, No recording, unless I get all JRS to sing WITH me. Last year James Taylor did a wonderful version of In The Bleak Midwinter, a beautiful Advent hymn. I love listening to the Swingin' Christmas station on Pandora. I listen to a lot of these songs. My favorite album is the Cheiftains Christmas. One album my kids and I listen to a lot is the Phineas and Ferb Christmas. Their version of the Twelve Days of Christmas is pretty funny. For those of you writers who wrote stories that take place during Christmas, did you listen to Christmas music to get into the spirit of the story? Will look up JTs version of In the Bleak Midwinter, as Julia and I have both used titles from the song. Best Drummer Boy I ever heard was by the Pipe and Drum corps -- real drums do sound better than Bar-rum . . . The excellent, beautiful soprano soloist on four of the pieces sounded and looked so beautiful, an angel on earth (in a dress that reminded me of Nancy Martin's Blackbird sisters). There was a violin solo on an interesting electric violin, something I'd never seen. The mayor of St. Charles played sleigh bells on one piece, and she did quite well, didn't even seem too tired out by all that bell-shaking. At the end, they all donned Santa hats and played a Sousa-like medley. Tammy, exactly right about the Rat Pack Christmas album. My favorite version of "Baby It's Cold Outside" is from an album of the same name, with Sammy Davis Jr. But the version by Dean Martin from the Rat Pack is almost as good. Hank, I second all your same choices, and will add Karen Carpenter's version of "I'll be Home For Christmas". 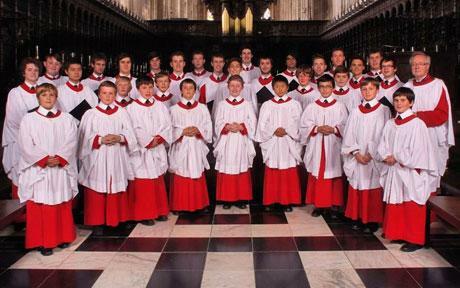 Of course I grew up Catholic, and singing in the choir for six or seven years, so any of the spiritual carols are so deeply ingrained. "Ave Maria", which isn't actually a Christmas song, but could be, was my grandmother's favorite, and Handel's Messiah cannot be beat for sheer grandeur. What about Straight No Chaser, the a cappela group? They have some pretty good Christmas music, too. iTunes is ticking me off, keeping what looks like duplicate tunes, but "not finding" any of them. I'm about to heave the program out the window, except that I've spent a small fortune buying music. Has anyone else had a bad experience with this program? Almost as bad as Captcha, which is working my last nerve today. Karen, we don't do iTunes. You're not buying the music, just "leasing" it, and they have control over what you do with it. And that's not to mention the problems it causes with you computer! I'm a big believer in waiting for the proper season, so although I like Christmas music, it doesn't come out until after Thanksgiving. Bing Crosby singing, well, anything, but especially White Christmas. Love the Charlie Brown soundtrack, and I have CDs of Latino and steel drum Christmas music from when I was in Puerto Rico and St. Croix. Latest fave is a group called Straight No Chaser - a cappella classics and new ones. Excellent stuff. And the Christmas Shoes? Not only a complete downer, but a totally ridiculous story line! Oooh, love Christmas music of all flavors, and have a special soft spot for any song Mannheim Steamroller does. But my very favorite, most listened-to song? (Drum roll here)... Grandma Got Run Over by a Reindeer! Must be that very black sense of humor developed by ER nurses, Flight Nurses, Firefighters, EMS, and police. Whatever the cause, I do so love to listen and laugh and sing along. And yes, I know every word by heart. I confess I like I Want a Hippopotamus for Christmas. It makes me laugh. I also love We Rise Again. It's not a traditional Christmas song but it's often sung at Christmas around here and I've found it comforting to listen to the last few days. I usually begin listening to Christmas carols at the beginning of Advent. My preference is for the traditional, spiritual carols. All my siblings and I have loved the Christmas in a Monastery album since childhood. The friars at Mt Alvernia in NY recorded it many years ago. The family copy of it got passed around for years and years. We each have our own copy now. We were delighted to learn that it's available on CD. Some other albums that I enjoy are (I don't have the names exactly right) Christmas Piano and Harp Music, Celtic Christmas, a Mantovani Christmas CD that O picked up somewhere,Cristmas strings. I have some great cassettes but all my cassette players are dead! And I still love I Saw Mommy Kissing Santa Claus! I have been listening to an album called "Advent Songs" by Sojourn a lot of this month and slowly easing into Christmas music as Christmas gets closer. My favorite Christmas album is by Bruce Cockburn. Let's here it for Christmas music! Love it. Last year we went to see the Dave Koz Christmas show and Jonathan Butler did the most fantastic version of "Little Drummer Boy" I've ever heard in my life. This year, Shela E. did the song and, while very good, I thought Butler's version was far more moving. I get sick of radio stations playing Christmas music all the time. There are two in my area that do that. They may have started before Thanksgiving. I do like to hear some X-mas music, though. I like Madonna's version of Santa Baby. It's on one of the C.D. 's that support the Special Olympics. Okay, now I remember what it's called, A Very Special Christmas. There are quite a few of those C.D.'s. They have different singers and I like the variety of that. I like the Home Alone Christmas album. I'm not into too much of the older music (crooners, etc. ), but I like Blue Christmas, Rockin' Around the Christmas Tree, and Jingle Bell Rock (Hall and Oates redid it). I have an old cassette tape that had Christmas music played on the organ. It was a good tape. Some favorite novelty songs are I Want a Hippopotamus for Christmas, Christmas at Ground Zero (Weird Al), and Disco Santa (it combines two Village People tunes with new X-mas lyrics). Such fun today! Things I've never heard of and now have to look up! Love that Hippopotamus for Christmas song, but it does cause the dreaded earworm! I hadn't heard it in decades, until just a couple of years ago. Did a musicologist unearth my old junque from the land of lost and forgotten childhood things? And now I not only know what a vegetarian is, I am one.